The Hot Tub Superstore broke all of its own records last week by delivering and installing 54 hot tubs right across the UK, in just seven days. The Blackpool based company are one of the UK’s leading hot tub retailers and are currently being filmed by ITV for new documentary ‘Hot Tub Britain’ to be aired in September 2014. It smashed its sales records year on year and the company were also delighted to have broken its own delivery and installation record and the team are confident that this will also be a UK record. Sales Director, Ross Phillipson said: "As a business we set ourselves targets and are delighted when we beat them, but this week’s news that we have managed to deliver and install 54 hot tubs across the country in just seven days is fantastic. "It’s testament to our logistics manager and the great team of delivery drivers we have that we can achieve such a feat. 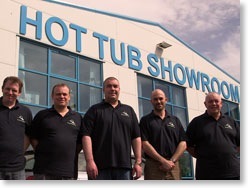 It takes on average 3 hours to install each hot tub, on top of the delivery time, so the entire team has really been working flat out to meet our customers’ expectations in this, the busiest week in The Hot Tub Superstore’s history."